Federico V., Gaillard J-M., Lemaitre J-F., Allaine A., Cohas A. (2018) Evolutionary pathways to cooperative breeding in Mammals- The role of ecology. Sfécologie2018, Rennes, France. Ferrandiz-Rovira M., Cohas A. (2018) Incorporating adaptive responses to climate change to explore future scenarios of wildlife distributions: insights from different populations of Alpine marmots. Functional Ecology Conference, Nancy, France. pdf. Garcia R., Rey B., Pardonnet S., Cohas A. (2017). Social environment shapes the stress response of Alpine marmot pups (Marmota marmota). 13th student meeting: Ecology and Behaviour, Chizé, France. Marchand T., Evan A., Fuchs B., Rey B., Singh N., Arnemo J.M., Arnold W., Canale C., Pardonnet S., Cohas A. (2017) Drivers of hibernation in marmots and bears. 6th International Bio-Logging Science Symposium, Constanz, Germany. Ferrandiz-Rovira, M., Cohas A, Allainé D. and Callait-Cardinal M-P. (2015) Specific alleles of the major histocompatibility complex (mhc) class ii and age influence prevalence or abundance of intestinal parasites in alpine marmots (Marmota marmota). World Association for the Advancement of Veterinary Parasitology (WAAVP), Liverpool, UK. Berger V., Lemaître J.-F., Gaillard J.-M., Cohas A. (2014) How do animals optimize the size–number trade-off when aging? Insights from reproductive senescence patterns in marmots. British Ecological Society, Lille, France. Tafani, M., Allainé, D., Cohas, A. 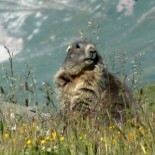 (2013) Effet des changements climatiques sur une population de marmottes Alpines (Marmota marmota). 36ème colloque de mammalogie,Toulouse, France. Ferrandiz-Rovira, M., Lemaître, J-F. , Lardy, S., Claramunt-Lopez, B., Cohas, A. (2012) Evolutionary trade-off between weapon length and sperm size in large herbivores. 8th Ecology and Behaviour congress of the SERL, Chizé, France. Lardy, S., Cohas, A., Desouhant, E., Tafani, M., and Allainé, D. (2012) Paternity and dominance loss in male breeder: The cost of helpers in a cooperatively breeding mammal, the Alpine marmot. 8th Ecology and Behaviour congress of the SERL, Chizé, France. Tafani, M., Allainé, D., Cohas, A. (2010) Growth pattern and senescence in body mass of a medium sized herbivore (Marmota marmota). Ecologie 2010 Conference, Montpellier, France.